It’s all too easy to be critical of Lima models – as they come, they can appear crude and basic to our eyes these days. And they are basic, but at the time of their release they represented progress from older models. The standard of tooling was a world away from some of the models then on sale. Even today new manufacturers struggle to capture moulded detail with the same delicate and subtle touch of the Lima toolmakers. And it’s this which leads me to persevere with a number of Lima types. Which brings me neatly to the model in question here. The outline is unmistakably Lima – is this a winning combination of Lima’s tool making with a better mechanism (and sound!) for much less than the more sophisticated alternatives? Hornby acquired Lima and its range a number of years ago – I suspect it was mainly to Hornby a foothold in the European market but the range of British models also came with this. A select few have made their way into Hornby’s budget range of ‘Railroad’ models. 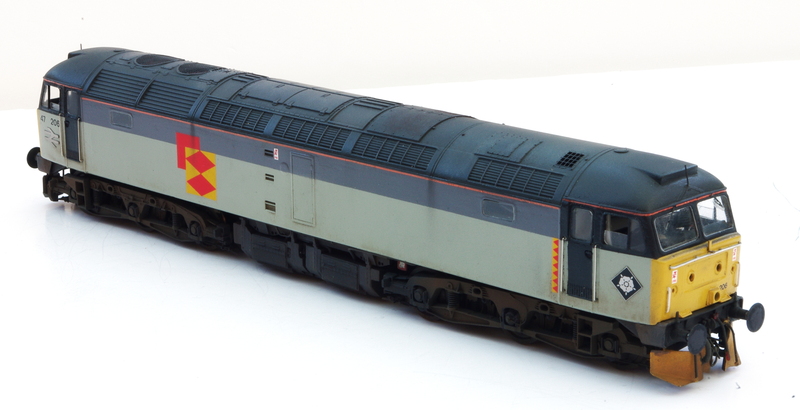 The former Lima class 47 has appeared in a number of guises under the Hornby label. This model, however, is one of the more notable versions. The former Lima model has received an all new power bogie which runs quite nicely and is very quiet in operation – the model has all wheel pick and runs very confidently at low speed. The old Lima bogie tooling has been modified further to accommodate NEM coupling pockets and have lost the massive Lima style couplings! Of course this isn’t the first release of the Railroad version of the class 47, but this is the first Railroad version I’ve had myself. Well, not strictly true, I’ve had a couple of Railroad bodies which I’ve bought second hand, but it’s identical to the Lima version so it tells you very little! They both have the same lovely and subtle tooling around the roof but suffer from the same issues which I’ve covered elsewhere – in the main, it’s the window surrounds which are the worst bit with more subtle problems with the shape and curvature of the ‘nose’ and the horn cowling. All issues which can easily be corrected. The only other thing is an odd one – for some reason Hornby have changed the buffers which are fitted to the model compared with the Lima ones – the latter’s were a nice size and proportion, even if not that detailed at all whereas Hornby’s are rather short stubby things which give the front of the loco a slightly odd, ‘bunged up’ look. 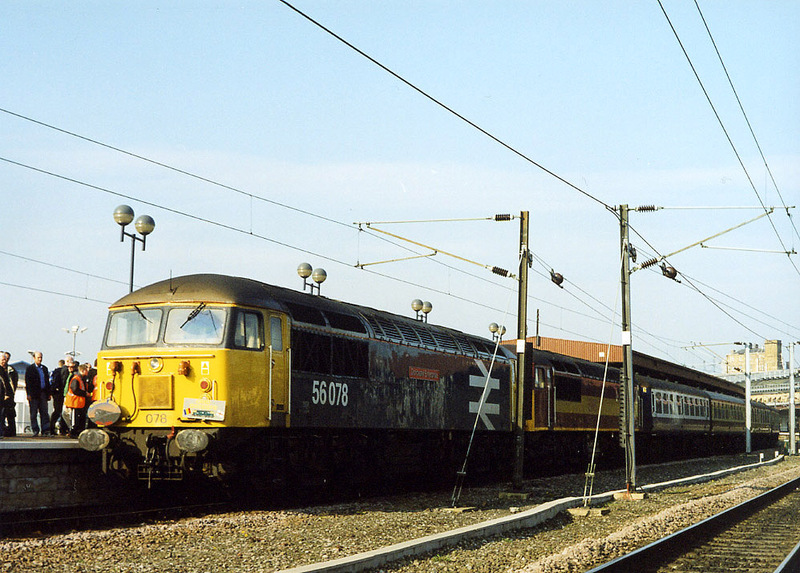 Decoration is to a high standard and the paint very well applied but I’m not convinced by the colours – it doesn’t sit well with with either locos which have retained their Lima paintwork or have been resprayed using Phoenix paints. The lack of OLE flashes and the orange cantrail stripe are very obvious by their absence. Although I realise this is a budget model, leaving details like these seems a real shame – it does appear as penny pinching, regardless of what the financial implications for Hornby. If the windscreen wipers can be picked out in black, why not add add the cantrail stripe instead? While the coupling would have been welcomed like a long lost relative twenty years ago, the funny short buffers really spoil things. The bright red tail lamps look wrong too – when the lamps are off, the have a much darker, crimson and . maroon appearance. Red looks rather toy like I feel. The chassis is exactly the same as the Lima version with a lot of plastic where there should be daylight, the ‘moulded gap’. It does give the model a rather dated appearance – although I’m happy to chop and modify Lima models, it’s a different situation here. 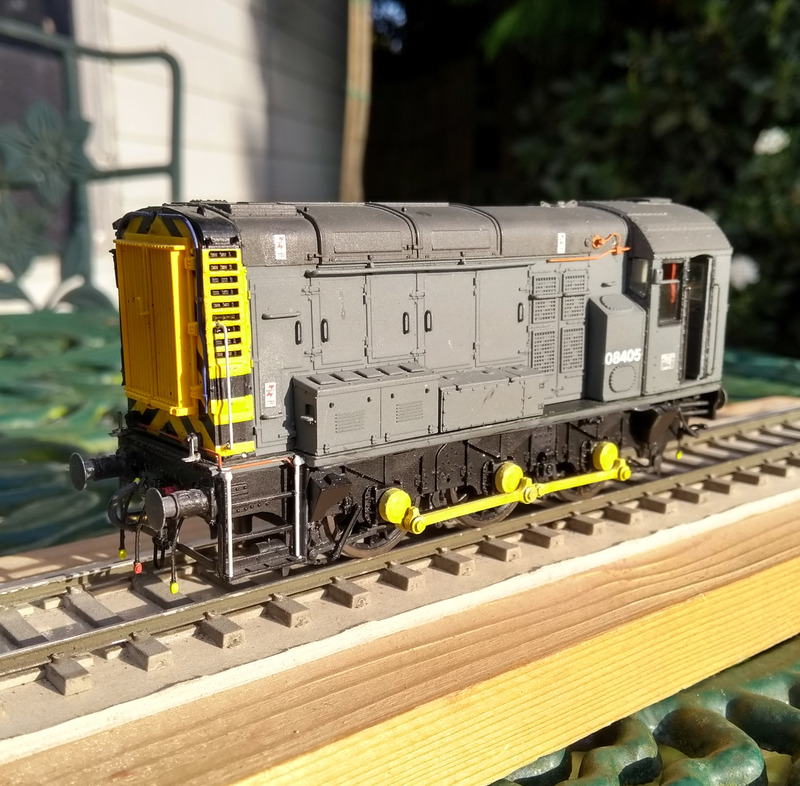 With the Lima ones I’m hacking at older models which I’ve bought cheaply or had for years, here we have a brand new model which needs the same treatment! Not a problem but some people may be apprehensive. But we need to remember that this is a budget model which is priced some considerable way below other RTR class 47s on the market. At £89.99 it’s still not cheap but for what you get as a package, it’s rather good. Of course the main attraction is the sound! So for less than the cost of a sound decoder, we have a complete locomotive. But the main question is, is it any good? Hornby have been very keen to promote their Twin Track Sound (TTS) products. The price is, I think, the main selling point. Much of it is subjective. For me sound is good up to a point but overly loud locos can dominate layouts and not be particularly pleasing. When a train passes the sound of the loco is only part of it – watch a freight pass and its the roar of the wagons which causes most noise. Few layouts really use sound effectively, Mark Tatlow’s Portchullin is one where sound seems to be perfectly executed, subtle unlike many exhibition layouts running sound locos! So is sound part of our pursiut of realism or just a bit of fun? Well, that’s up to the individual – I can see the fun my little boy had running the loco up and down a four foot test track! My main issue is the severe lack of weight which affects the model’s tractive effort significantly – Lima used the rather crude but effective method of sections of steel bar for weighting its British models, Hornby have used a die-cast weight in its place. There is a cut out to accommodate the speaker which reduces the weight even more. Once I get to work I’ll address the weight issue – anyone who’s converted Lima models will be used to this anyway! It should improve both haulage and slow speed running. The roof is one of the best areas with this model – since we normally look down on a our models, this is no bad thing either. The subtlety of the Lima tool making is not always equalled by more recent releases. As a package, I think the model works really well – you can argue that it lacks all sorts of things. These extras will cost money, and Bachmann provide a readily available alternative if you desire more factory applied details and a choice of liveries anyway. So a basic model which is well proportioned and sounds pretty good for this sort of money sits quite well with me. 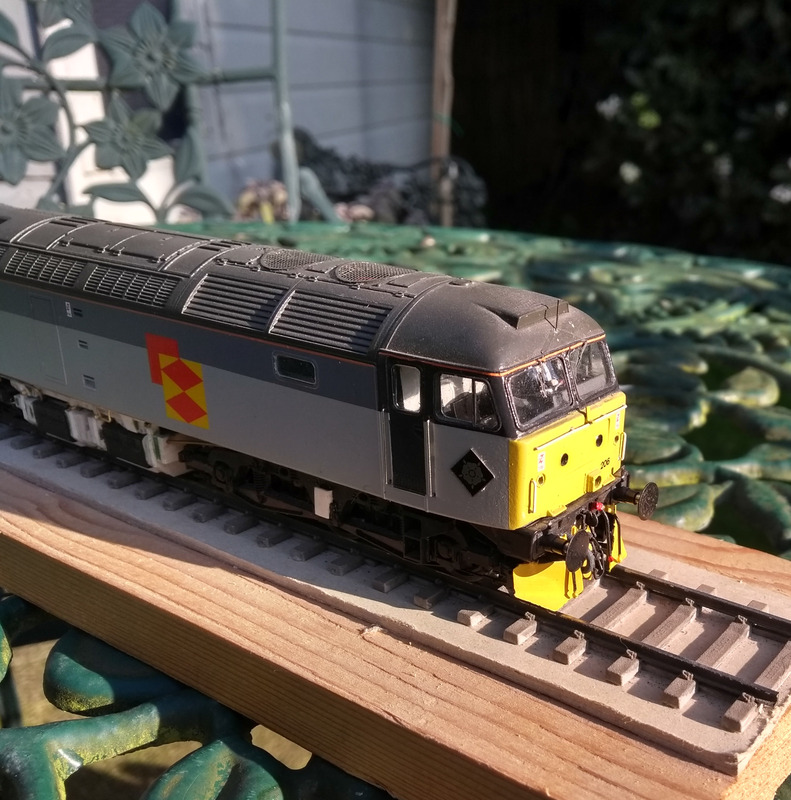 If you shop around you can get the TTS class 47 for just short of seventy quid too which makes it a very attractive proposition, especially as second hand prices on eBay and Facebook seem to verging on the ridiculous! Plus it provides an excellent base for further work. Spend a few quid on parts from Shawplan and along with a few other details and time you can easily build a model which can easily eclipse more expensive options. This is definitely an option which deserves consideration.